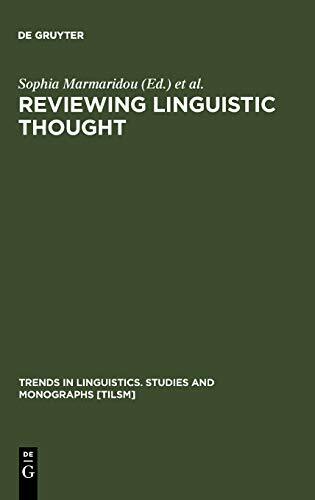 [PDF] Reviewing Linguistic Thought: Converging Trends in the 21st Century (Trends in Linguistics. Studies and Monographs, 161) | Free eBooks Download - EBOOKEE! Description: The volume focuses on the interaction of different levels of linguistic analysis (syntax, semantics, pragmatics) and the interfaces between them, on the convergence of different theoretical models in explaining linguistic phenomena, and on recent interdisciplinary approaches to linguistic analysis. Its theoretical importance lies in bringing out and highlighting some of the common trends and directions found in recent theoretical frameworks which focus on themes traditionally downplayed by mainstream 20th century linguistics. It further familiarizes the reader with the methodology used in such frameworks and shows how methodology developed in different theoretical perspectives can often converge in yielding similar results. While representing different traditions, all papers in this volume assume a necessity for the study of language to be paired with the study of cognition and for linguistics to develop more substantive links to other disciplines, thereby creating converging trends into the new century. The structure of this volume reflects this assumption along a cline of theoretical models and methodologies, starting from those that view language as part of cognition and ending with those that consider the language faculty to be distinct from general cognition. Thus the volume is divided into five parts: (I) relaxing level boundaries, (II) focusing on level interaction, (III) drawing on different theories, (IV) exploring field interaction, and (V) interdisciplinary perspectives on modularity. The volume is of particular relevance to scholars and students who are interested in an in-depth overview of 20th century linguistics outside/beyond the generative paradigm, and in exploring the development of 20th century legacy into current work. No comments for "[PDF] Reviewing Linguistic Thought: Converging Trends in the 21st Century (Trends in Linguistics. Studies and Monographs, 161)".